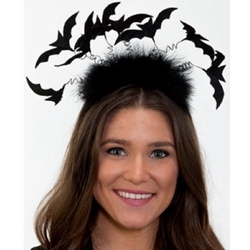 The Boa Headband with Bats is available in One Size Fits Most Adults. This Headband is topped by an array of marabou style feathers, and emerging from the feathers is a group of bats! Several bats hang from the headband and move about as you move. This gives the bats a sense of animation as they flutter about. If you want a fun headpiece that moves as you move, or if you really like bats, this is the perfect headband for you!